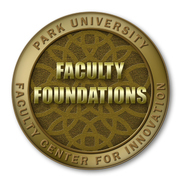 New full-time faculty actively participate and collaborate with new colleagues in all sessions of the multi-day New Faculty Orientation event, to provide a foundation of educational life at Park University. Additionally, faculty actively attend at least 75% or more of the monthly new faculty reconvening sessions, designed to connect all new faculty on a monthly basis and provide customized support based on their unique needs and acclimation to the university. New full-time faculty participate in Park’s 2-day orientation, organized by Academic Affairs and the Faculty Center for Innovation (FCI). Faculty learn Park’s history and organizational structure, support systems (both for students and faculty), Park’s learning management system, and teaching techniques. A checklist and time is provided for important tasks that need completion before the first day of class. Additionally, eight hour-long, monthly reconvenes occur throughout the academic year.